In addition to a uniform initialization of the flow variable over the domain/mesh, the Subdomain-based initialization allows to set a different value of the variable (compared to the rest of the domain) in a specific region of the domain called a ‘sub-domain’. 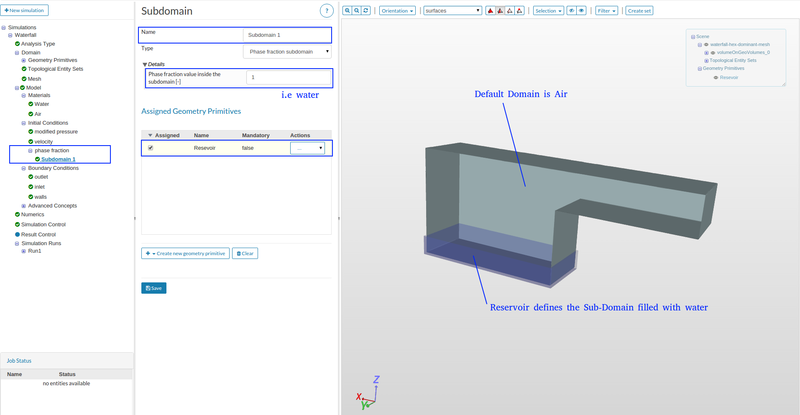 Where available, a ‘sub-domain’ could be defined using a ‘geometry primitive’ in the simulation setup and further via ‘volume regions’ for Conjugate Heat transfer (CHT) analysis type only. Subdomain-based initialization is an straightforward method, e.g in case of multiphase simulations, to specify parts of the domain/mesh with different fluid materials. For instance, if we require a specific part of the flow domain/mesh to be filled initially with e.g. ‘water’ and the rest with ‘Air’ this can be done by a “sub-domain” based initialization under ‘Initial Conditions’ for the flow variable ‘Phase fraction’. The fluid ‘Air’ was defined by ‘phase 0’, thus representing a ‘phase fraction = 0’ in the multi-phase system. Similarly the fluid ‘water’ was then defined by ‘phase 1,’ representing a ‘phase fraction = 1’, to be identified by in the multi-phase system. Then a “subdomain” is created and assigned the ‘geometry primitive’ entity (Reservoir) to define the sub-domain region and then specified as filled with water by giving a phase-fraction = 1.